This recipe reminds me so much of my family back in the Philippines. I used to live in a coastal town in the southern part of Cebu, “Dalaguete” in particular. Our house was close to the beach; you can actually hear the sea waves lashing against the shore during monsoon seasons and smell the salty air all year round. I remembered having some of our fishermen friends and relatives came over to our house in the mornings bringing with them fresh catch of the day. Sometimes, my dad will meet them at the beach during sunrise just as they were returning home from the fishing trip and buy kilos of fish. Some of those he bought were made into fish tinola or “tinuwa” or “tuwa” in my native Cebuano dialect. A piping hot tinolang isda with warm, boiled white rice or corn grits on the side make an ideal breakfast for our family, especially during the colder months. 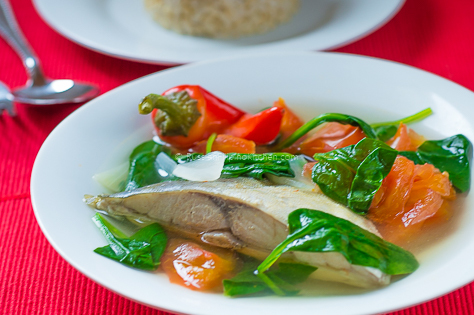 Tinolang isda or fish tinola is a well-loved soup dish in the Visayas and Mindanao region of the Philippines. It’s a low-calorie, non-fat dish loaded with vitamins and minerals. You can use any type of fresh fish (bone-in much better) for the soup. It’s flavored with lemongrass and ginger which add a distinct taste and pleasant aroma to the soup. Some leafy greens such as malunggay leaves, spinach, sweet potato (camote) tops, or pepper leaves are added almost at the end. Other ingredients include onion bulbs or spring onions, as well as tomatoes. Seasoning is simply salt and pepper according to taste, although some prefer to add flavor enhancers such as fish bouillon cube to heighten the flavor. 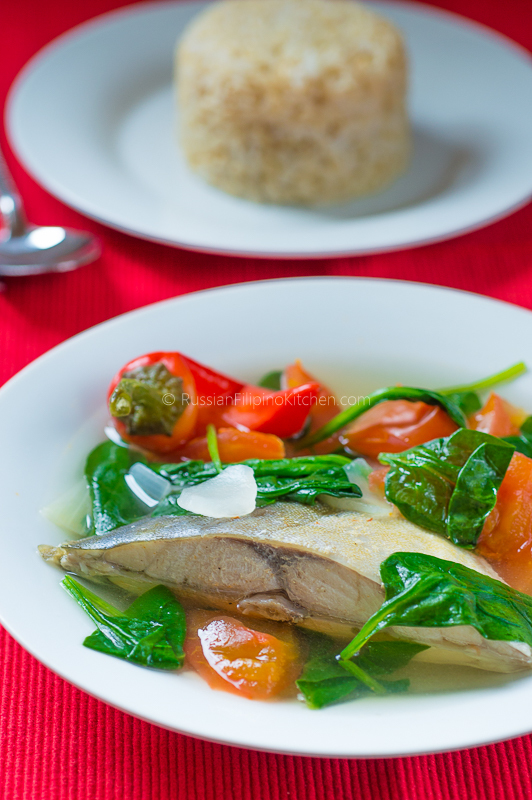 Fish tinola is usually a clear, watery soup but don’t let it discourage you for it’s really tasty! Yields: Varies (Number of servings vary depending on the number of fish slices. 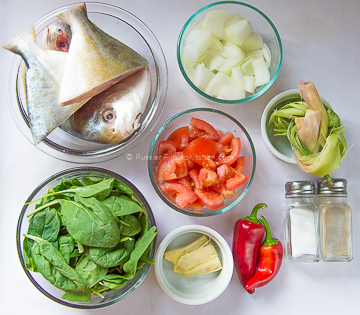 One serving is usually one slice of fish ladled into a bowl along with the broth and vegetables. 1. 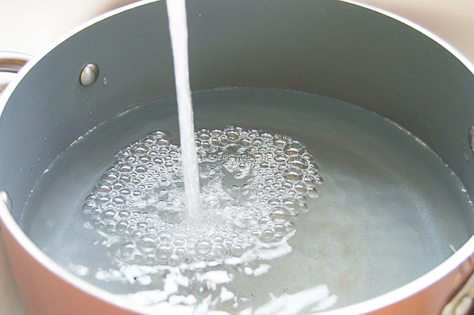 Fill cooking pot with about 12 cups of cold tap water. 2. Throw in crushed ginger and lemongrass and cover. 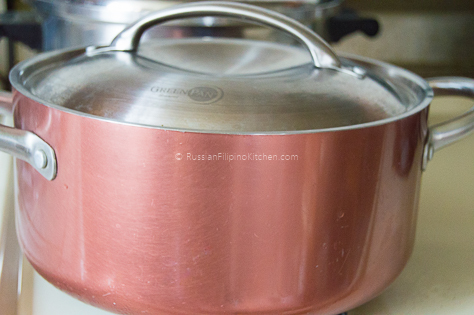 Turn on heat to high and bring pot to a boil. 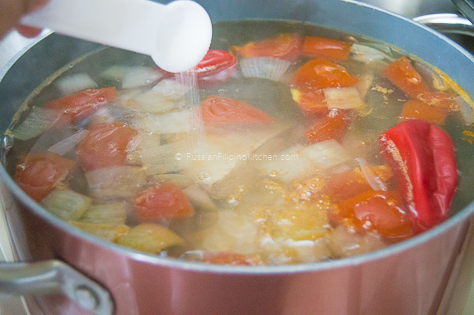 Once boiling, lower heat to medium high and simmer for 15 minutes. 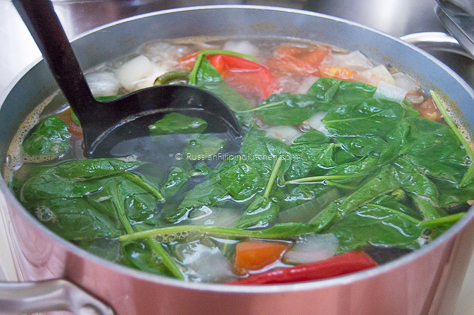 This allows the flavor from ginger and lemongrass to seep into the water, before adding the rest of the ingredients. 3. 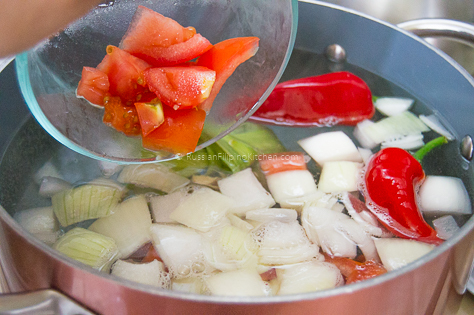 Add chili peppers, chopped onions, and tomatoes. Bring to a boil and simmer for about 5 minutes. 4. Carefully add the slices of fish into the pot. Season with salt and pepper, then cook for additional 15 minutes. 5. Turn off heat and throw in the leafy greens (spinach in my case), stir, and allow to wilt for about a minute or so. 6. Serve hot.